Not all gemstones are of the same quality. While some rubies are clear and beautiful, others are dull, filled with flaws, and the color of old blood. Scientists have found that chucking them in a serious microwave can really improve them. This is not the first time people have used technology to improve gemstones. Lasers and chemical treatments are known to improve the shine and the quality of crystals. This is the first time that scientists have used microwaves to do it. 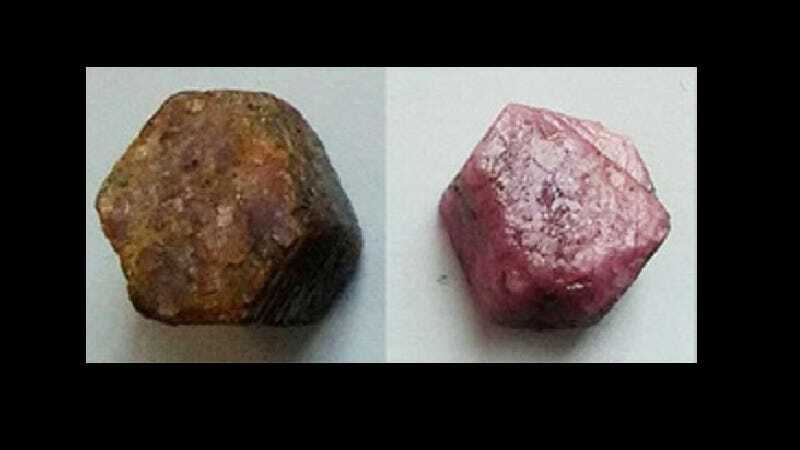 Researchers at the CSIR-Institute of Minerals and Materials Technology in India have used a microwave to increase the quality of a ruby. The microwave used was not a standard home appliance. It was an industrial microwave furnace that heated the stone to 1,500 degrees Celsius. Scientists don’t know exactly what happened, but they do know that the color lightened and the stone grew more lustrous and clear. The researchers believe that the heat caused changes in the structure of the aluminum-oxide, which is the main component of rubies, and the chromium, iron, and titanium that give them their red color. This isn’t just an aesthetic change. Rubies are often used in lasers and masers (microwave lasers), and are popular because, aside from diamonds, they’re one of the hardest crystals out there.